Skye Gravestones | Neil & Christina Campbell. 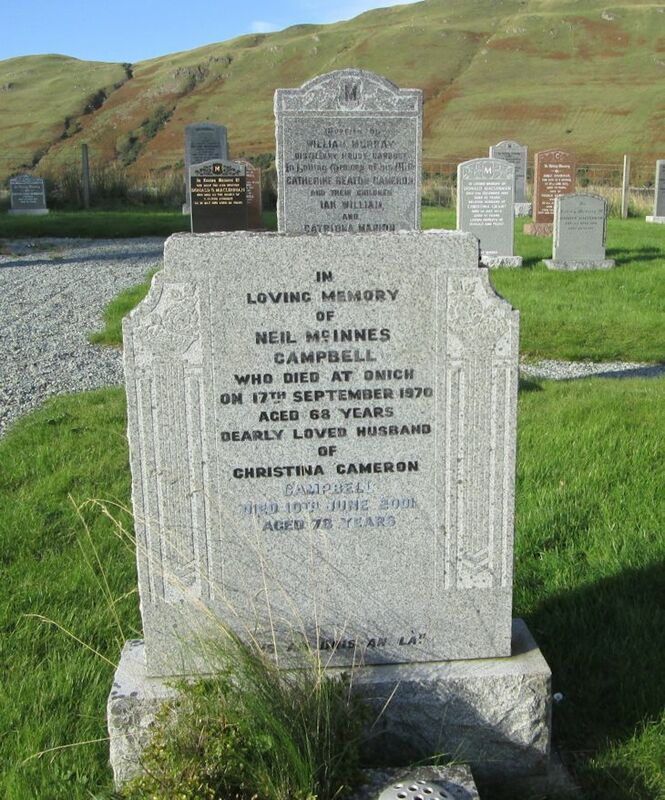 In/loving memory/of/NEIL McINNES/CAMPBELL/who died at Onich/on 17th September 1970/aged 68 years/dearly loved husband/of/CHRISTINA CAMERON/CAMPBELL/died 10th June 2001/aged 78 years. "Gus am bris an là." I think this Neil Campbell is a cousin of my Grandfathers, I am working on our family tree and trying to trace the Campbell's of Soay. I visited Onich with my father usually on our way to Skye to visit Neil's sister and 2 brothers. Added by Ann Grant on 14 September 2015.